Johann Friedrich Fasch (15 April 1688 – 5 December 1758) was a German violinist and composer. Fasch was born in the town of Buttelstedt, 11 km north of Weimar, the eldest child of schoolmaster Friedrich Georg Fasch and his wife Sophie Wegerig, from Leißling near Weißenfels. After his father's death in 1700, Fasch lived with his mother's brother, the clergyman Gottfried Wegerig in Göthewitz, and it was presumably in this way that he made the acquaintance of the Opera composer Reinhard Keiser. Buttelstedt is a town and a former municipality in the Weimarer Land district, in Thuringia, Germany. It is situated 11 km north of Weimar. Since 1 January 2019, it is part of the town Am Ettersberg. 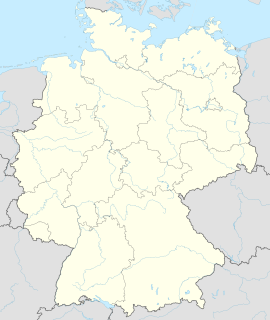 Weimar is a city in the federal state of Thuringia, Germany. It is located in Central Germany between Erfurt in the west and Jena in the east, approximately 80 kilometres southwest of Leipzig, 170 kilometres north of Nuremberg and 170 kilometres west of Dresden. Together with the neighbour-cities Erfurt and Jena it forms the central metropolitan area of Thuringia with approximately 500,000 inhabitants, whereas the city itself counts a population of 65,000. 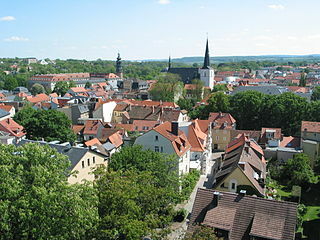 Weimar is well known because of its large cultural heritage and its importance in German history. Leißling is a village and a former municipality in the Burgenlandkreis district, in Saxony-Anhalt, Germany. Since 1 September 2010, it is part of the town Weißenfels. Johann Kuhnau was a German polymath: known primarily as composer today, he was also active as novelist, translator, lawyer, and music theorist, being able late in life to combine these activities with the duties of his official post of Thomaskantor in Leipzig, which he occupied for 21 years. Much of his music, including operas, masses, and other large-scale vocal works, is lost. His reputation today rests on a set of programmatic keyboard sonatas published in 1700, in which each sonata depicted in detail a particular story from the Bible. After his death, Kuhnau was succeeded as Thomaskantor by Johann Sebastian Bach. The Collegium Musicum was one of several types of musical societies that arose in German and German-Swiss cities and towns during the Reformation and thrived into the mid-18th century. In 1714, unable to procure aristocratic patronage for a journey to Italy, Fasch instead travelled to Darmstadt to study composition for three months under his former Leipzig prefect Christoph Graupner  and Gottfried Grünewald. He then traveled extensively in Germany, becoming a violinist in the orchestra in Bayreuth in 1714, was an amanuensis in Gera till 1719 and from 1719 until 1721 held a court post as organist in Greiz. Johann Christoph Graupner was a German harpsichordist and composer of high Baroque music who was a contemporary of Johann Sebastian Bach, Georg Philipp Telemann and George Frideric Handel. 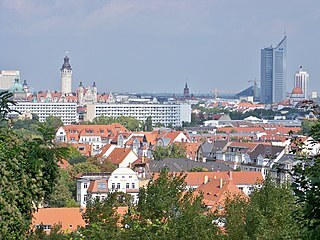 Gera is the third-largest city in Thuringia, Germany, with 96,000 inhabitants, located 55 kilometres south of Leipzig, 75 km east of Erfurt and 120 km west of Dresden. His next major post was Prague, where he served for two years as Kapellmeister and court composer to Count Morzin,. In 1722, he "reluctantly accepted the position"  of court Kapellmeister at Zerbst, a post he held until his death. (The organist Johann Ulich was his assistant.) Also in 1722, he was invited to apply for the position of Thomaskantor in Leipzig at his alma mater, the St. Thomas School, but he chose to withdraw his name from the competition. The Leipzig opening was eventually filled by Johann Sebastian Bach, who had considerable esteem for Fasch. Count Morzin was an aristocrat of the Austrian Empire during the 18th century. He is remembered today as the first person to employ the composer Joseph Haydn as his Kapellmeister, or music director. The first few of Haydn's many symphonies were written for the Count. Kapellmeister is a German word designating a person in charge of music-making. The word is a compound, consisting of the roots Kapelle and Meister ("master"). The word was originally used to refer to somebody in charge of music in a chapel. However, the term has evolved considerably in its meaning in response to changes in the musical profession. Zerbst is a town in the district of Anhalt-Bitterfeld, in Saxony-Anhalt, Germany. Until an administrative reform in 2007, Zerbst was the capital of the former Anhalt-Zerbst district. A symphony is an extended musical composition in Western classical music, most often written by composers for orchestra. Although the term has had many meanings from its origins in the ancient Greek era, by the late 18th century the word had taken on the meaning common today: a work usually consisting of multiple distinct sections or movements, often four, with the first movement in sonata form. Symphonies are almost always scored for an orchestra consisting of a string section, brass, woodwind, and percussion instruments which altogether number about 30 to 100 musicians. Symphonies are notated in a musical score, which contains all the instrument parts. Orchestral musicians play from parts which contain just the notated music for their own instrument. Some symphonies also contain vocal parts. In 1900, Reimann asserted that Fasch's style was an important link between the Baroque and Classical periods, and that he was one of those who "set instrumental music entirely on its feet and displaced fugal writing with modern 'thematic' style’";  New Grove's entry on Fasch states, "Later research has largely confirmed [Reimann's] assessment." Fasch died in Zerbst at the age of 70 on 5 December 1758. He was the father of Carl Friedrich Christian Fasch, born on 18 November 1736, like his father a musician of note. The city of Zerbst/Anhalt has been hosting International Festivals since 1983, biennially since 1993. The Thirteenth International Fasch Festival took place in Zerbst/Anhalt on 15–19 April 2015. This listing is based on Rüdiger Pfeiffer's now out-dated Fasch Werke Verzeichnis. The Internationale Fasch Gesellschaft e.V. has been working on a new online Fasch-Verzeichnis, which is now called Fasch-Repertorium. Its main contributor, Dr. Gottfried Gille, gave a paper on the project's progress at the 2013 international Fasch conference, held on the occasion of the twelfth International Fasch Festival (18-21 April 2013). All papers presented at the conference were published in vol. 12 of Fasch-Studien. Fwv D:J 1 \ Jauchzet dem Herrn alle Welt; Edition 2008 Gottfried Gille for Prima la musica! Fwv D:S 2 \ Sanftes Brausen, süsses Sausen; Edition 2008 Gottfried Gille for Prima la musica! Fwv K:D14 \ Suite for 2 horns, 2 oboes & bassoon in D major * Modern edition in preparation by Kim Patrick Clow for Prima la musica! Fwv K:F 7 \ Suite for 2 oboes & 2 bassoons in F major * Modern edition in preparation by Kim Patrick Clow for Prima la musica! Fwv K:G 2 \ Suite for violin & oboe concertante in G major * Modern edition in preparation by Kim Patrick Clow for Prima la musica! Fwv K:G 8 \ Suite for 3 flutes & 2 bassoons in G major * Modern edition in preparation by Hans-Heinrich Kriegel for Prima la musica! Fwv K:G16 \ Suite for 2 oboes & bassoon in G major * Modern edition in preparation by Kim Patrick Clow for Prima la musica! Johann Friedrich Fasch Concerto in D for Three Choirs ("Royal Fireworks Music"), FWV L:D13, movement no 2 "Andante"
Johann Christoph Friedrich Bach was a harpsichordist and composer, the fifth son of Johann Sebastian Bach, sometimes referred to as the "Bückeburg Bach". Trevor David Pinnock is an English harpsichordist and conductor. Georg Christoph Wagenseil was an Austrian composer. This is a list of notable events in music that took place in the year 1735. The year 1717 in music involved some significant events. František Xaver Dušek ; baptised 8 December 1731 – 12 February 1799) was a Czech composer and one of the most important harpsichordists and pianists of his time. The four orchestral suites, BWV 1066–1069 are four suites by Johann Sebastian Bach. The name ouverture refers only in part to the opening movement in the style of the French overture, in which a majestic opening section in relatively slow dotted-note rhythm in duple meter is followed by a fast fugal section, then rounded off with a short recapitulation of the opening music. More broadly, the term was used in Baroque Germany for a suite of dance-pieces in French Baroque style preceded by such an ouverture. This genre was extremely popular in Germany during Bach's day, and he showed far less interest in it than was usual: Robin Stowell writes that "Telemann's 135 surviving examples [represent] only a fraction of those he is known to have written"; Christoph Graupner left 85; and Johann Friedrich Fasch left almost 100. Bach did write several other ouverture (suites) for solo instruments, notably the Cello Suite no. 5, BWV 1011, which also exists in the autograph Lute Suite in G minor, BWV 995, the Keyboard Partita no. 4 in D, BWV 828, and the Overture in the French style, BWV 831 for keyboard. The two keyboard works are among the few Bach published, and he prepared the lute suite for a "Monsieur Schouster," presumably for a fee, so all three may attest to the form's popularity. Christoph Förster was a German composer of the baroque period. Charles Dieupart was a French harpsichordist, violinist, and composer. Although he was known as Charles to his contemporaries, his real name may have been François. He was most probably born in Paris, but spent much of his life in London, where he settled sometime after 1702/1703. A prominent member of the Drury Lane musical establishment, Dieupart was active both as composer and performer and actively participated in the musical life of the city. However, after about 1712 he earned his income mostly by teaching, and in his later years lived in poverty. He is best remembered today for a collection of six harpsichord suites which influenced Johann Sebastian Bach's English Suites. The trumpet repertoire consists of solo literature and orchestral or, more commonly, band parts written for the trumpet. Tracings its origins to 1500 BC, the trumpet is a musical instrument with the highest register in the brass family. Johann Pfeiffer was a German violinist, concert master and composer of the late baroque period. Tafelmusik is a collection of instrumental compositions by Georg Philipp Telemann (1681–1767), published in 1733. The original title is Musique de table. The work is one of Telemann's most widely known compositions; it is the climax and at the same time one of the last examples of courtly table music. ↑ Kramer, Ursula (2011). "The Court of Hesse-Darmstadt". In Owens, S. Music at German courts, 1715-1760 : changing artistic priorities. Boydell & Brewer. pp. 333–364. ISBN 9783825809980. ↑ Brian Clark, "Revision and recycling in Johann Friedrich Fasch's oeuvre," in Fasch-Studien 11, "Fasch - Vater und Sohn, ortus musikverlag, 2011"
Reul, Barbara (2011). "'Forgive us our debts' – Viewing the life and career of Johann Friedrich Fasch (1688-1758) through the lens of finance.” Eighteenth-Century Music 8, no. 2 (2011), pp. 261–286. Modern urtext editions of Fasch's music via Brian Clark's Prima la Musica!